Dallas Pianist Don Ambrose plays upbeat music for cocktail parties, relaxing music for dinner, and dance music that swings. Don has an amazing repertoire of Standards, Pop, and all the best known and most requested songs. Cindy and her Jazz Harp group are regularly heard on the radio, television, and at festivals and concerts throughout the United States. Cindy has recently written and published a Jazz Harpists' theory book. Dallas' Carlos Gudes combines jazz with Latin rhythms to create a new Pan-American Jazz. George can assemble the perfect combination of players to provide just the right ambiance for...luncheons, dinner parties, wine tastings...or any occassion. Dallas jazz combo Trio Blanc (violin, guitar, and upright bass) plays a sweet and spicy blend of old standards, hot swing, bossa nova, ballads, and light classical music. 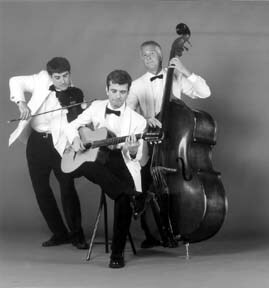 The trio also features the music of legendary gypsy-jazz guitarist, Django Rheinhart. From the sultry to the sophisticated, Trio Blanc plays it all with flair.